SIGforum.com Main Page Reloading Is this brass reloadable? Not until its clean, lubed, full length sized & deprimed, trimmed/chamfered, re-primed, powered and seat a projectile. When I was competing and reloading mass quantities of .45acp, all my brass looked like that, despite a lowered ejection port. Never lost a case due to that dent. Yep, it's worth saving. 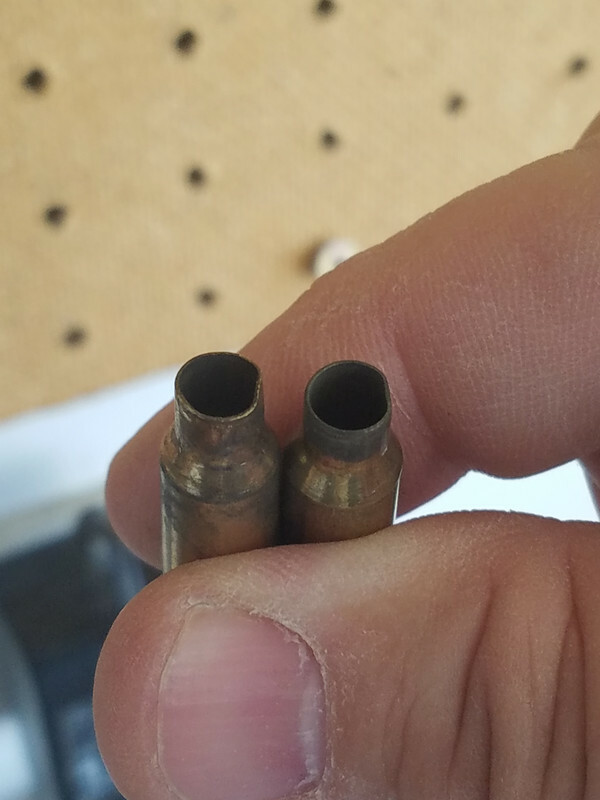 Another reason for case lube with rifle or bottleneck cartridges. Completely normal. I've reloaded brass where the neck is almost closed and you have to use a dowel or something to open the neck enough for the expander ball to enter. I think all AR brass looks like that with maybe a dent in the side of the case sometimes. Quick Reply to: Is this brass reloadable?